If you’re anything like me, you maybe love to make a huge fuss of your family during the holidays. If you’re getting together for a special meal on Boxing Day or New Year’s Eve this is a lovely way to make it an occasion. 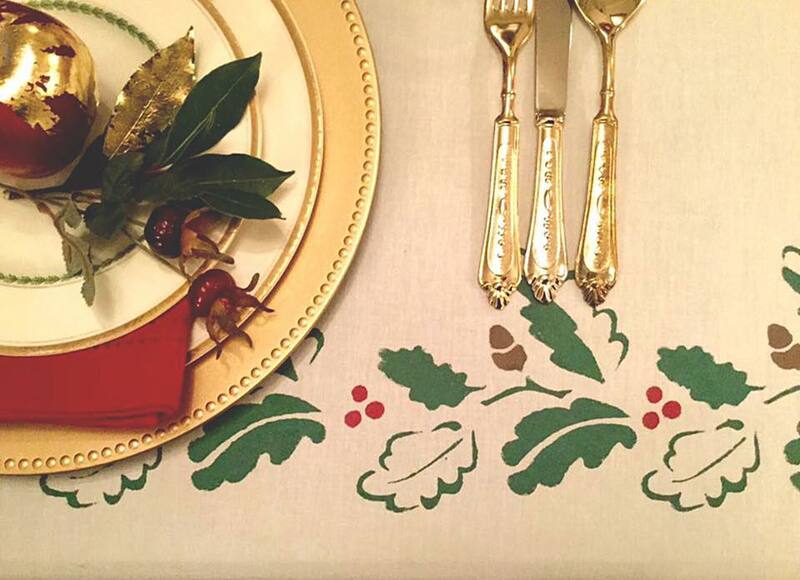 I upcycled this plain tablecloth (you could easily use a plain cotton flat sheet) to create a traditional red and green backdrop for our table. 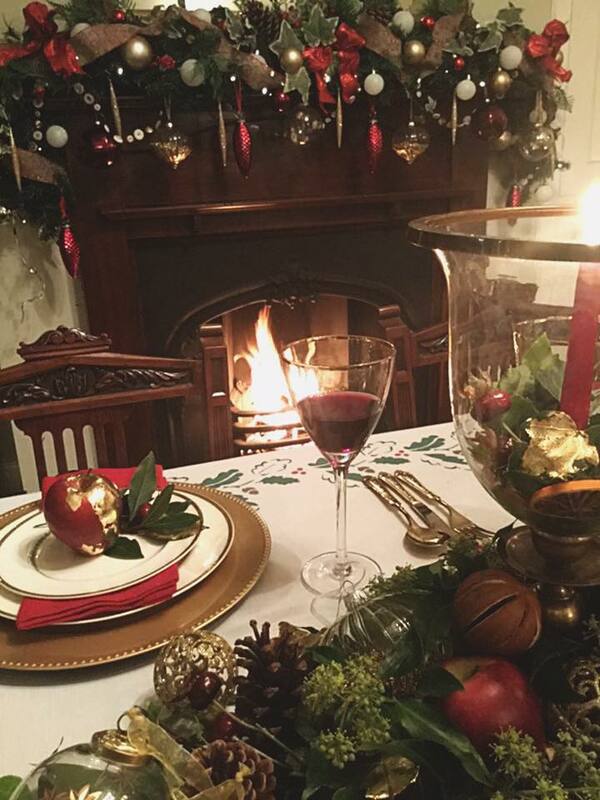 Me and Mr Mendes are huge fans of traditional Victorian Christmas colours and have a tree in each room and a swag over the fireplace so to complement that styling, I used the Oak Leaves stencil by Annie Sloan. It’s a lovely repeat pattern with leaves and acorns. As you can see above, I used Amsterdam Green by Annie Sloan and added a trio of festive red berries (these are not part of the stencil) using Emporer’s Silk. It’s easy to add dots by hand! If you saw my Instagram stories you’ll know we have a loft full of decorations in all shapes and sizes in our Victorian colour scheme. That includes faux fruit and berries. Here I decorated an everlasting russet apple with a random stripe of gold leaf using Gold Size by Annie Sloan and brass transfer leaf for the gold effect. 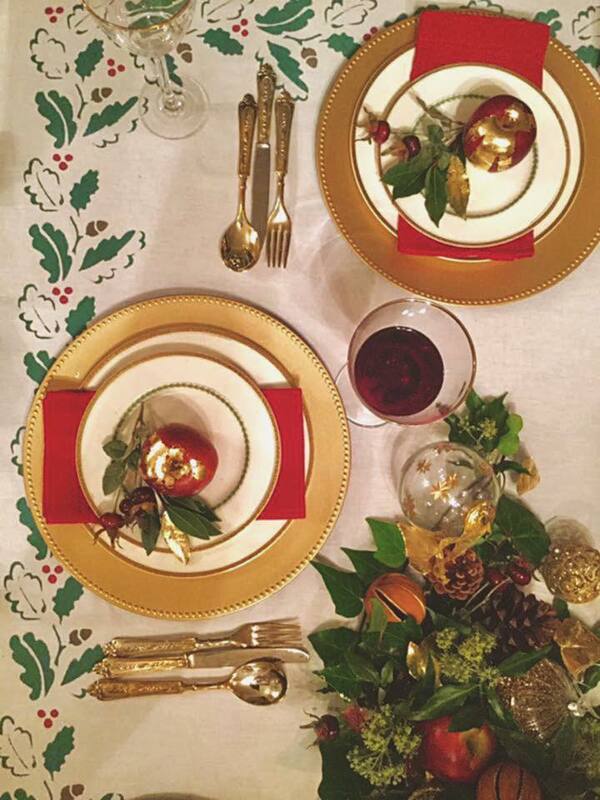 A pile of gold trimmed plates, red napkins and a sprig of berries creates a lovely place setting for each guest. 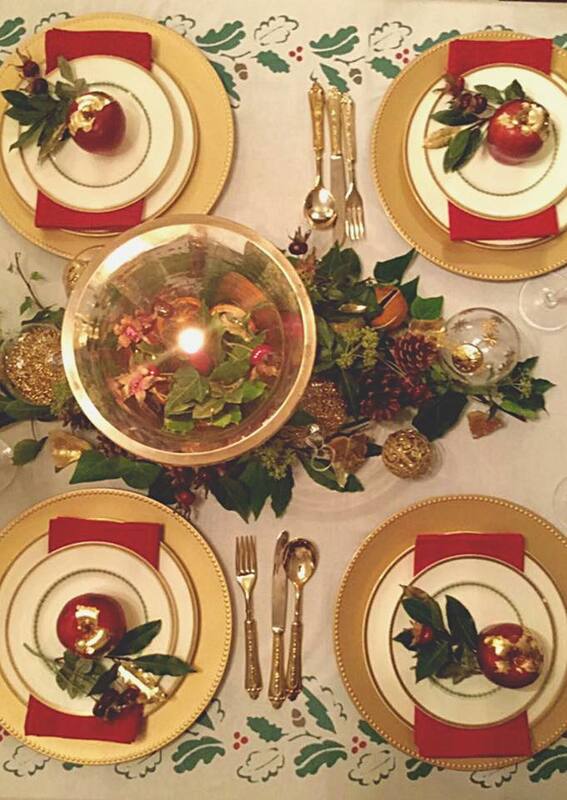 I love mixing up by decorations in a new way every year so glass and gold baubles that might be on the tree one year find their way into a simply styled centrepiece featuring fresh apples, dried oranges, foraged pine cones and freshly cut greenery from our garden. 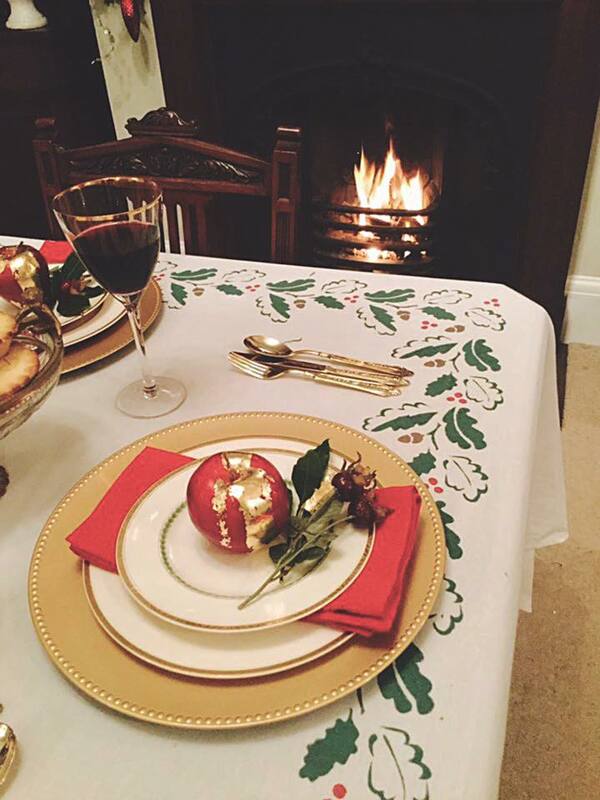 It’s informality, in contrast to the formal place settings, just works! 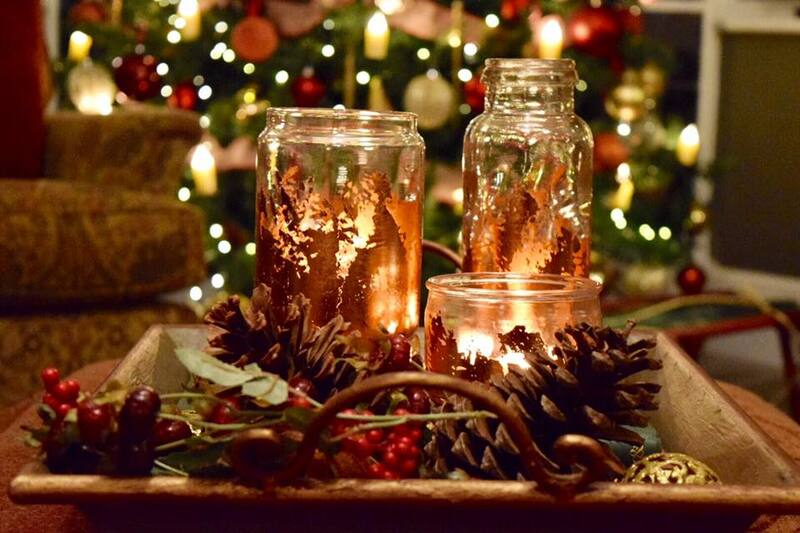 A glowing candle at the heart of the table – what more could you want? At the centre of the centrepiece I used a glass bell jar with a dinner candle to create a focal point that works wherever you’re sitting. I’ve taken a few pictures overhead so you can see how well it all works together including our golden cutlery and stacked charger plates, all united with the stencil border. This is a great dinner party look for formal entertaining occasions. 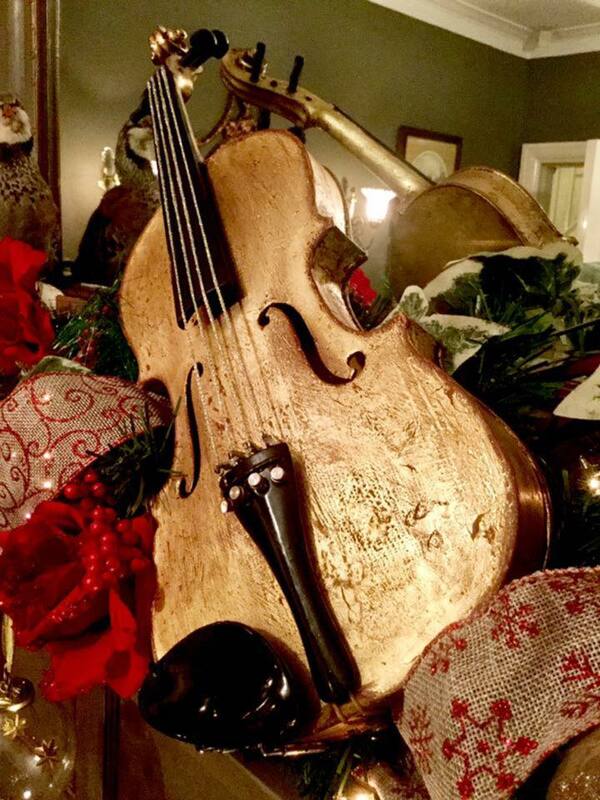 It works really well with my Gilded Violin project too. If you prefer a more rustic look, don’t forget to check out my rustic hessian stencil table runner and my copper kissed glass jar lanterns. Both would work brilliantly for a more informal Boxing Day supper or Burn’s Night. If you have any table decor projects, I would dearly love to see them – please feel free to share this post with your own communities and do tag me on Instagram (@jonathonmarcmendes_paintedlove) or share your ideas below. Next Post Rock star painting day with Jonathon Marc Mendes!